The WCRS has a table at this year’s Calgary Mini Maker Faire! We are looking for a few people to assist, and to represent the WCRS and the WCRG. We need commitment on volunteers to properly plan this; the day is filled with meeting the public and representing what we do best – ROBOTS! Capacity for this year’s event is around 1500 people a day, and all attendees are people who have paid admission. We also have an opportunity to host a “Learn to Solder” workshop if we can find extra volunteers to assist. This is a great workshop and was received extremely well last year. We would need roughly 2-3 People for this event per day to host and assist patrons. The event is Saturday 10am-6pm (Sep 14th) and Sunday 10am-5pm (Sept 15th). Volunteers will be reimbursed a per diem, up to $20 per day of volunteering, to cover parking and lunch expenses. Please remember to keep your receipts! Please email me ( hepatus AT gmail DOT com ) with what you can contribute with and/or for, and the final list will be compiled on Saturday Sep 7th. This entry was posted in WCRS on September 1, 2013 by Brutus. Described by Jay Ingram as the “most remarkable young maker” that he has EVER seen, we are proud to introduce Joe Willis: Beakerhead’s much adored and hyper-talented youth ambassador. L: What are you making/ building these days? J: I have so many projects on the go that I don’t know where to start. The list of completed projects is much, much shorter. When it came time to prepare for CYSF 2013 I sadly couldn’t include everything that I had prepared. It was tough to cut some things out. Even then my trifold board was barely visible behind all the stuff I wanted to exhibit. When I go to places like Western Canada Robot Society (WCRS) or the Botzone, I am like a pinball, bouncing around learning about what other people are up to and it all sounds good to me. 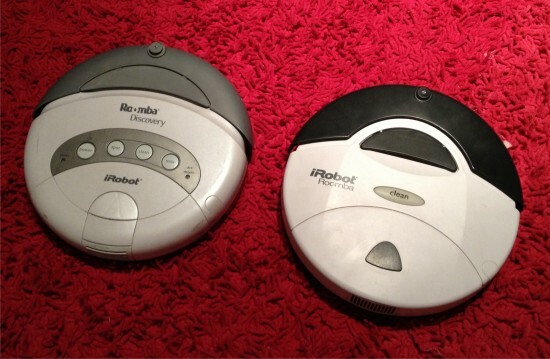 This entry was posted in Culture of Robots, Local Community, Local Robotics, Robotics, WCRS on May 2, 2013 by Brutus. Come hack with us at Protospace’s Tuesday night Meet and Geek tonight and for the price of admission to the Robot Games ($40) you could find yourself going home with a robot ready for the May 11th competition! We’ll be doing 2 building sessions at the same time, some will be outfitting Roombas with a new battery, an Arduino, & Din connector to compete in a timed obstacle course and others will be re-purposing RC Trucks to compete in a no-holds-barred race across an outdoor landscape to make it from point A to B without getting stuck. Find Jim and Mark at Protospace to get you setup and ready to compete. And as a Bonus if you spend $40 (or more) tonight your entry fee to the robots games will be covered! 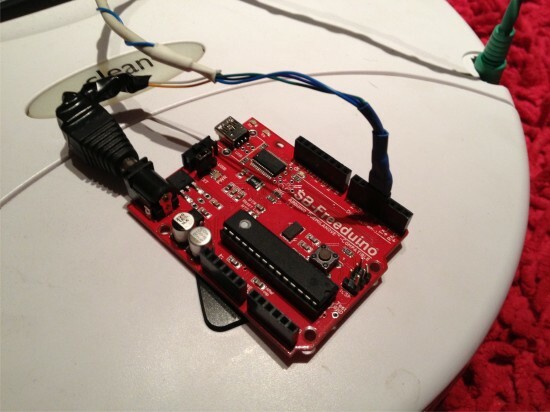 This entry was posted in WCRS on April 30, 2013 by Jeremie Boulianne. We’ll pull out the mini sumo rings and do some practice rounds so that everyone can tune and have time to refine. If you register prior to May 10th, you’ll be in for the GoPro Hero3 draw! This is only open to competitors, so you’ve got really great odds of winning. GO NOW> REGISTER! For you minesweepers out there, we’ll be on hand to discuss the event. There are 2 parts to the event and if you approach the event properly, you’ll do fine. Register and come on down! Solarbotics has donated a special “Bring Out Your Robots” prize pack for tomorrow. For everyone that comes with their robot, we’ll put your name into a hat. At 12:00 noon, we’ll draw a name for the winner. So what’s in the Prize pack? 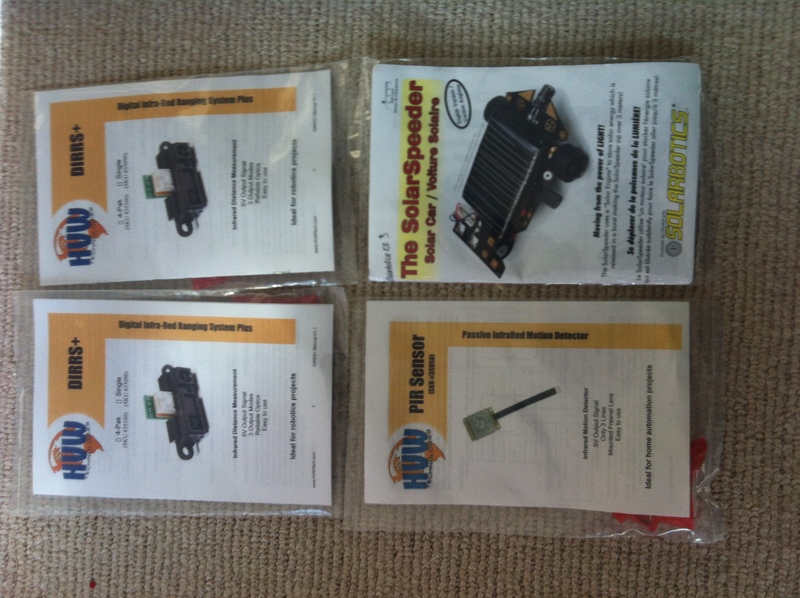 2 Distance Sensors, a PIR sensor and a SolarSpeeder Kit! Totaled up, that’s a prize worth about $75!!! Admittance to the Aerospace Museum is free for anyone that is coming for the WCRS between 10am and Noon. If you know someone who is interested in robotics but hasn’t had the opportunity to get involved yet, bring them by! We have 2 workshops left before the games that will result in a competition ready robot to keep! There is also plenty of time to build various kits and get them ready to enter. While the workshops are going on, we’ll be on-hand to support kit builds. This entry was posted in WCRS on April 26, 2013 by Brutus.